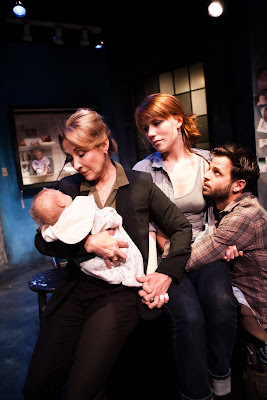 Scene from Zayd Dohrn's Reborning at the San Francisco Playhouse. SAN FRANCISCO -- What do you do if you’re a young, rising playwright and you’re the son of Bernadine Dohrn and Bill Ayers? You write plays about parents and children and about parenting. That’s what Zayd Dohrn, the oldest of three sons raised by Dohrn and Ayers, has done in his one-act play Reborning, which is on stage off, off, off Broadway at the San Francisco Playhouse. If you don’t live in the city or nearby it might be long way to go to see a 75-minute play that races along, but if you can go in the next month or so it’s a fascinating piece of theater that speaks to our time now, and that also shows where we’ve come from as a society. Part comedy, part tragedy, Reborning mixes satire with real pathos, and makes for laughter and for tears. The play features only three characters: a young woman who has been abandoned by her mother; an older woman who has lost a baby and wants a replacement; and a young man who brings them together tenderly in a kind of family. The older woman might in fact be the biological mother of the younger woman, but the play leaves the relationships ambiguous, as though to say that we can choose or not choose our parents and our children, and make the families we want to make. The narratives we tell ourselves and one another are all-important. Nothing is fixed or unalterable in Zayd Dorhn’s world and everything is possible. Secrets come to light, the past is peeled away, and scars are healed almost overnight. It’s tempting to read Reborning as an autobiographical work, and there’s no doubt that Zayd Dorhn drew upon his own emotional crosscurrents to write his play. Growing up an underground kid with fugitive parents wanted by the FBI gave him plenty of sensational material and dramatic, real life characters to mirror. Still, his characters aren’t copies of his parents or their contemporaries. Unlike them, his fictional people are pulled to art rather than to ideology, and express themselves in creative work rather than in political struggle. Reborning takes theatergoers through a kind of emotional hell that includes dumpsters, death, and denial, but it’s a therapeutic work that ends on a note of reconciliation. The characters clash with one another; they shout and they argue, but they don’t hit, shoot, and bomb, and the play offers no big blow-up. The final scene is an unclimactic kind of climax, but nonetheless genuinely heartfelt. It reflects a world in which mistakes are unmade, and seemingly irreconcilable differences are resolved peacefully. The tensions between the two women -- the mother/daughter figures -- drive the play, but it’s the male character who brings them together. He’s also the comedian of the piece and he supplies the sexual energy that can be as funny as it is steamy. In the first scene of the play, he walks around on stage holding a huge phallus in his hand and that irreverent image sets the tone for much of the play. Could the male character be inspired by his father and could the women be inspired by his mother? Maybe so. Zayd Dohrn was in the audience the evening Reborning had its premier in San Francisco -- the celebrity in the crowd. His parents were in the audience, too, though no one seemed to recognize them. They might still have been anonymous underground fugitives out on the town for the evening, not the infamous Dohrn-Ayers duo in the media at the time of Obama's election. Like many of the sons and daughters of former Weather Underground fugitives, Zayd Dohrn has come of age, and put the underground behind him. “Reborning” seems an apt metaphor for his own evolution as a playwright who dramatizes the theater of the human heart.